The #1 thing you’re going to need when maintaining bright colored hair is a good conditioning regiment. I’m currently only washing my hair with shampoo twice per week. However, I regularly deep condition my hair to re-moisturize. 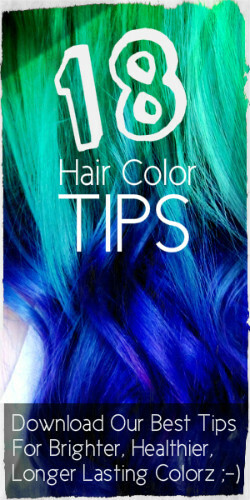 Here are 3 options I recommend for anyone trying to maintain healthy bright colored hair…. 3 Minute Miracle is by far the best smelling deep conditioner. It says to wash out after a short period of time, but I’ve left it on over night. I love how it leaves my hair feeling the next day and it practically removes all “dye” smell when I use it within the few days following an upkeep dye session. I’ve used the moist one, as they didn’t carry the “color” option at my local store.You can also pick this up at Publix (local grocery store), Walmart, Target, Walgreens… pretty much any place that sells shampoo and conditioner. Ion Color Conditioner – I picked this up last time I purchase hair dye. I hadn’t tried it before but figured since I like many of the other Ion supplies I should give this a try.While I did like that my hair “felt healthy” – as in – it was smooth, less frizzy, etc. I didn’t really like that it had no smell. If I’m not washing my hair that often, I still like to make sure my hair smells nice and the leave in conditioners usually help me accomplish that.This one doesn’t really have a smell, but if your goal is to just repair your hair or deep condition it – then yes – this works well and was same cost as the 3 Minute Miracle. If those 3 weren’t enough to have in your arsenal of hair conditioners – then check out this review… she reviews like 10 different hair masks and conditions both from a salon and from your typical grocery store. What I liked most about her reviews were her tips on thin hair vs thick hair. I have naturally thick hair and a lot of it, so what works best for me isn’t always what works best for everyone.